Kiael Kelly, Jesuit: Since transferring from Tampa Catholic this summer, Kelly had been battling to become the starting quarterback. In the season opener, the sophomore split time with Enzo Tedesco and completed three passes, all for touchdowns, in a win over Durant. With Tedesco injured, Kelly got the start against Steinbrenner and played well, throwing for 185 yards and three touchdowns in a 35-10 win that keeps the Tigers undefeated (2-0). The two likely will split time again if Tedesco is healthy. Boca Ciega: The Pirates started the season 0-2, and the odds of winning their first game of the season didn't look good. Boca Ciega hasn't beaten St. Petersburg since 2007. And the Green Devils started the season 2-0. The Pirates trailed 14-0 at halftime Friday, but scored 21 unanswered to pull out the win. Did the win over their rivals mean a lot? "It does, actually," said sophomore running back Chris Phillips, who scored the winning touchdown. "That's going to be history. And, plus, I played with most of these guys, so it's just big finally beating them." Evan Davis, Armwood: In the postgame huddle following the annual rivalry with Plant, Davis told his players: "We're not supposed to do this." The Hawks were supposed to be in a rebuilding phase. They start as many as eight sophomores. That inexperience was supposed to be a detriment, especially on the road in front of a frenzied crowd against a state powerhouse. That did not matter. Davis was able to get them to shake off an opening-week loss to Tampa Bay Tech and beat the Panthers 21-18. It was the first time Plant had lost a regular-season game at home since 2010. • Sunlake punter Clark Cooley did his part in a 7-6 loss to Wiregrass Ranch. He had three punts over 45 yards and had two others that landed inside the 20. One punt landed at the 5, which eventually led to the Seahawks' only touchdown when the Bulls botched a punt in the end zone. • Nature Coast sophomore Alex Florkowski was called up from JV to kick against Springstead. Florkowski, who is a midfielder on the girls soccer team, made two extra points in the 32-7 win. • East Bay used an onside kick on its first two kickoffs against Robinson. The Indians almost recovered the first one and did recover the second in a 35-12 win. • Cypress Creek won its first game in school history, 42-22 over Bishop McLaughlin. The Coyotes were 0-10 in their inaugural season in 2017 and outscored 470-40. They were 0-2 prior to Friday, but played Gulf and Fivay close. • East Lake made it 10 straight wins over neighborhood rival Tarpon Springs. The last time the Spongers won was in 2008, 27-17. The Eagles' streak started in 2009, a 13-3 win. • Gaither gave up 12 points to start its game against Lennard. The Cowboys then scored 35 unanswered. They caused six turnovers (two interceptions, four fumbles). Two fumbles were returned for touchdowns. • Countryside snapped a two-game losing streak to rival Clearwater and is 3-0 for the first time since 2014. Armwood receiver Ezeriah Anderson had just one catch for 8 yards against Plant. But the senior came up with two of the biggest plays down the stretch. Ahead 21-18, Armwood was inside Plant's 10 with 2:28 left when defensive back Leonard Parker intercepted a pass and raced past a number of Hawks. Anderson sprinted from the back of the end zone and tackled Parker near midfield, preventing a would-be touchdown. With eight seconds left, the Panthers attempted a tying field goal. Anderson got his arm up enough to block the kick, sealing the win for Armwood. It is common practice, even for bitter rivals, to trade game film. But Springstead coach Mike Garofano was having none of that before Friday's game against Nature Coast. 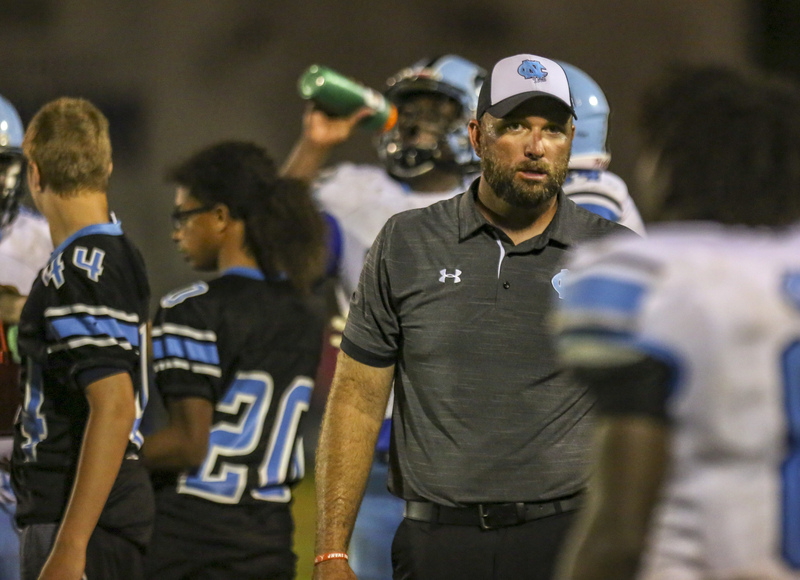 Garofano was steamed about what he thought was an obscene gesture made by Nature Coast players during last year's game, a 29-21 loss. So he did not make any film available to the Sharks. "That kind of irked me," Nature Coast coach Cory Johns said. "To me, it's totally unprofessional. It's never happened to me. I've been coaching for 10 years and a head coach for six. (Garofano) wasn't even professional enough to text me or anything. He just wouldn't trade. It just irked me." Garofano had no sympathy after last year's game. And he suspects it's the reason Nature Coast called timeout with 50 seconds left in the game and up 25-7 on third and goal from the 2 Friday night before scoring a touchdown. "That's the class-less things that they do," Garofano said. "That's the reason I didn't trade. Then this year, up three scores with 50 seconds left and they call timeout. That's just who they are. We have no respect for them. They go against everything we teach our kids. Low class, no character over there. I have no problem saying that. And it's not sore losing. They beat us up and down the field. But it goes from the top down. You breed that culture. It's no class." Next year's game should be fun.